If you are like most of the business owners and marketing executives we work with, you probably don't want to unintentionally drive new customers away from your website. In fact, the thought of watching that revenue slip away probably makes you queasy. Even so, we see websites every single day that have fatal flaws. Despite their best intentions, the owners of these sites are doing their very best to scare buyers into clicking in another direction. 1. Unconventional or sloppy designs. Although it might seem unfair to lump "unconventional" and "sloppy" web designs together, to your customers they are one and the same problem. That's because all of us use dozens of websites every day. We know what they're supposed to look like, and how they should work. When you deviate too far from that, you make it difficult for people to actually use your site, which makes them want to look for answers elsewhere. 2. Hidden content. When you have content on your website that isn't crawled by search engines, or can't be found within your internal link structure, you have a problem. That's because it's going to essentially be invisible for most customers. In that case, you can’t get the sales you want because they can't find the information they need. 3. Huge blocks of text. Have you ever come across a web page that has lots and lots of information, but in long, imposing paragraphs without any subheadings? If so, then you already know how easy it is to just take your attention elsewhere. Having big blocks of uninterrupted text is like inviting visitors to take their time and attention to one of your competitors. 4. Pop-ups and obtrusive ads. Although some marketers swear by on-page pop-ups, blinking ads, and other forms of Internet obnoxiousness, the reality is that readers will usually tolerate them, but almost never like them. There are plenty of ways to make your most important offers stand out without driving visitors aggressively from your website. Why shout when a whisper will do just as well? 5. Unanswered questions. There are probably a lot of basic questions you're used to hearing about your products or services: how much they cost, how long they take to get, what "fine print" comes along with the purchase, and so on. If these aren't answered on your website, it makes it seem as if you have something to hide. Making your business stand out, online or off, is hard enough without shooting yourself in the foot. So, if you notice one of these five blunders on your own website, take care of it now before it can impact your business even more. 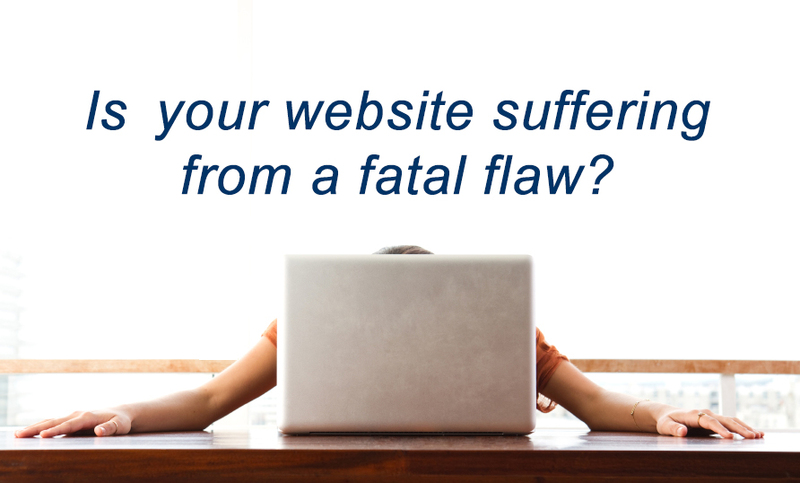 Is your website suffering from a fatal flaw? Talk to the creative team at WebRevelation today by calling 817-283-3324.